Journalism.co.uk feels like its gone back in time today – specifically to autumn last year when regional newspaper groups, unions and industry bodies were voicing unanimous opposition to the BBC’s plans to increase its local video news content. Well, another year, another video plan – and more opposition. Yesterday the corporation announced an agreement to share news video from four subject areas with the Guardian, Telegraph, Daily Mail and Independent websites. The clips will appear in a BBC-branded player and run alongside the papers’ own news coverage. In the announcement, the corporation suggested it would extend the plans to other newspaper websites – and asked third parties to register their interest. “The BBC’s plans to offer free video content to newspaper websites risk undermining the demand for content from independent news providers, potentially undercutting a very important revenue stream,” said ITN CEO John Hardie in a release. According to a MediaGuardian report, News International says the arrangement is far from a ‘free deal’ for the papers, but rather free marketing for the BBC, which will lead to less diffentiated content on newspaper websites in the UK. Meanwhile the Press Association said it had spoken with the BBC Trust about the plans before they were announced and was hoping for a market impact assessment – a process it says cannot now be completed because of yesterday’s launch. In a statement given to both Press Gazette and MediaGuardian, a spokeswoman for the PA said there were other ways for the BBC to work with commercial rivals, such as by sharing facilities. The PA launched its own video newswire for newspapers earlier this year and has said the BBC’s plans undermine investment in video by commercial players. Arguably, providing a pool of news video for diary events/supplementary content could free up the titles’ staff to cover original content and produce more multimedia of their own. A similar argument to the PA’s recent announcement of a ‘public service reporting’ trial. One question that should be asked – hinted at in Alick Mighall’s blog post on the matter – how will the commercial details be hammered out? Will the BBC add pre-roll ads for BBC programming to the clips; and what if a pay wall is erected in front of the video players? This entry was posted in Broadcasting, Multimedia, Online Journalism and tagged Alick Mighall, BBC, BBC Trust, CEO, Daily Mail, guardian, Independent, ITN, john hardie, Journalism.co.uk, News International, newspaper groups, pa, player, Press Association, spokeswoman, telegraph, The Guardian, the Telegraph, United Kingdom, Video on July 29, 2009 by Laura Oliver. It’s now four years – give or take a few weeks – since broadband Britain reached its tipping point. Halfway through 2005 there were finally more homes connected to the internet via high speed broadband than via achingly slow dial-up. Video on the web suddenly made a lot more sense. And given that we’re still in the early stages of this particular media evolution, it’s not surprising that we are are still learning. …provided you build something elegant and easy to use. And then market it like crazy. This was the week that we learned how the hugely successful BBC iPlayer has overtaken MySpace to become the 20th most visited website in the UK . The iPlayer is now comfortably the second most popular video site even if its 13 per cent share is still dwarfed by YouTube’s 65 per cent. If you want more evidence of success just look at the BBC’s terrestrial rivals. ITV, Five and even Channel 4 – which had a year’s head start over the BBC – are now aping the look, feel and functionality of the corporation’s efforts. No hefty applets to download – just click and play. Of course, this model – a different player for each network – will look anachronistic within a few years. Maybe less. Hulu arrives on these shores soon. If you are going to put moving pictures on your newspaper website it’s a good idea to ask why? And the answer should be that it adds something to your storytelling. Last week the Independent completed a deal that sees the Press Association providing more than 100 90-second clips a week, each focusing on a single news item. Nothing wrong with the quality or content of the video that the Indy is getting, but where’s the added value? Unless the video has some killer footage or a must-see interview, why would a reader of a 500-word news article click play? I’m not sure they would. If it’s visual, it needs pictures and maybe video. If it’s verbal, sound will do. For everything else, words are cheaper for the producer and quicker for the consumer. Singer Chris Brown chose YouTube as the medium to deliver his first public pronouncements following February’s assault on his now ex-girlfriend Rihanna. He plumped for the video-sharing site rather than a TV or newspaper interview presumably so he could control the message – no out-of-context editing of his words and no awkward follow-up questions. To some extent he got his wish. Within 24 hours of posting his 120-second, unmediated mea culpa, it had been viewed nearly half-a-million times. More significantly, however, the video had received over 12,000 comments and most were hostile. In an oddly defensive post on its YouTube Biz Blog, the people behind Google’s file-sharing site set about busting what it claims are five popular myths. Over 70 per cent of Ad Age Top 100 marketers ran campaigns on YouTube in 2008. They’re buying our homepage, Promoted Videos, overlays, and in-stream ads. Many are organizing contests that encourage the uploading of user videos to their brand channels, or running advertising exclusively on popular user partner content. We wait, breathlessly, for a follow-up post so we can discover how many of these elite brands made a return on their YouTube investment. Nearly a month after his passing, Michael Jackson’s life is still being celebrated online. Eight out of this week’s viral video top 20 are either Jackson originals or owe their inspiration to the singer. A case of the long tail occupying the head. For a few weeks at least. Jon Bernstein is former multimedia editor of Channel 4 News. This is part of a series of regular columns for Journalism.co.uk. You can read his personal blog at this link. This entry was posted in Comment, Multimedia and tagged BBC, Britain, broadband, Channel 4 News, Chris Brown, editor, file sharing site, google, head, ITV, Jon Bernstein, Journalism.co.uk, message Singer, michael jackson, multimedia editor, Myspace, particular media evolution, player, Press Association, producer, Rihanna, singer, United Kingdom, Video, video sharing site, video site, YouTube, YouTube Biz Blog on July 22, 2009 by Jon Bernstein. Following on from last month’s UK event on microblogging, Media140, a new event dedicated to all things Twitter takes place today and tomorrow. 140Conf or ‘The 140 Character Conference’ features sessions on Twitter and TV; Twitter and newspapers; and Twitter for newsgathering, with contributions from BusinessWeek.com editor John A. Byrne (@johnabyrne), Tim O’Reilly (@timoreilly) and Andrew Keen (@ajkeen) amongst others. You can watch a livestream from 8:45am (EST) today – you’ll need to register and download the player. There’s also a great backchannel site hosting video, tweets, speaker profiles and latest coverage of the conference. This entry was posted in Events, Social media and blogging and tagged andrew keen, backchannel site, BusinessWeek.com, editor, John A. Byrne, player, speaker, Tim O'Reilly, TV, Twitter, Twitter stream, United Kingdom on June 16, 2009 by Laura Oliver. Joanna Geary’s overt self-correction of a blog post about the Birmingham Mail and the ex-Villa player, Gareth Barry, in contrast with the mainstream media’s handling of the Phil Spector Twitter hoax, was evidence for blogger and information architect Martin Belam of the ‘online honesty gap’ between bloggers and newspapers. This entry was posted in Editors' pick, Online Journalism, Social media and blogging and tagged BBC, blogger and information architect, communities executive, Currybet.net, ex-Villa player, excellent journalist, Gareth Barry, Jem Stone, Joanna Geary, mainstream media, Martin Belam, newspaper executive, online honesty gap, phil spector, Phil Spector Twitter, player, regulation, social media, The Birmingham Mail on June 8, 2009 by Judith Townend. Since its launch in March, Audioboo, the service which allows users to record and upload short audio recordings, has notched up 30,000 registered users and been taken up by both hyperlocal and international news media. This Saturday ITV.com is planning to use the tool as part of its FA Cup Final coverage: fans using the Audioboo iPhone app will be able to submit their audio reactions to the site. Significantly this seems to be the first foray into running a paid-for version of an Audioboo account. As CEO Mark Rock explains in this blog post, there will always be a free version of the tool, but the firm is developing a range of paid-for options intended for media organisations. Audioboo Pro will be the version used by ITV tomorrow, ‘which will contain a series of web tools which make it easy for companies, particularly media companies, to manage content coming from their audiences’. Key to these tools are ‘magic tags’ – a private tag that the account use can apply to any Audioboo content creating a specific feed for use in a player on their site. ITV are using this system to help moderate the ‘boos’ left by fans. The use of Audioboo by ITV marks a focus by the broadcaster on capturing the online buzz about the match alongside the roar of the crowd within Wembley Stadium. As such, the site will use Twitter aggregator Twitterfall to stream relevant updates to the microblogging site. This entry was posted in Broadcasting, Social media and blogging and tagged Audio reporting tool, Audioboo, CEO, FA Cup, FA Cup Final, hyperlocal and international news media, iPhone, ITV, ITV.com, Mark Rock, media, media organisations, online buzz, paid-for options, player, thruSITES, Twitter, Twitterfall, web tools, Wembley Stadium on May 29, 2009 by Laura Oliver. Yesterday’s InfoValet conference (‘From Gatekeeper to Information Valet: Work Plans for Sustaining Journalism’) at DC’s George Washington University had a great line-up of speakers debating the future of journalism in the online age, news aggregation, crowdsourcing and what’s next for the news media industry. One particular announcement of note: the launch of Circlabs – a technology company building a new service to finance online news. “More Americans now say they get most of their national and international news from the Web rather than from printed newspapers. Yet news publishers, and particularly publishers of the kind of essential journalism that’s necessary to sustain a democracy, enjoy a relatively small share of total Web traffic. The first stage will be a product called Circulate. Details are scant at the moment, but it’s expected to be available in beta from the end of the summer and fully launched by the end of this year. “Circulate addresses two critical publisher needs: (1) the need to attract, both locally and nationally, a strong and loyal online readership, and (2) the need to monetize that audience, both directly through the sale of premium content and indirectly through high-value, targeted and interactive advertising. This entry was posted in Events, Online Journalism and tagged circlabs, DC's George Washington University, George Washington University, infovalet, interactive advertising, loyal online readership, Martin Langeveld, news media industry, nieman journalism lab, online age, online news, player, post-search way, technology, Web revenue, web traffic on May 28, 2009 by Laura Oliver. It’s a bank holiday weekend here in the UK and the end of the season for the Premier League football clubs and promotion play offs in League One and League Two – so why not have some tweets with your footy? BSkyB owned football website TEAMtalk is going to be using Twitter (@TEAM_talk) to covering breaking news from the games – but aims to be more than just an automated updates feed. The site’s journalists will offer more info and analysis via the service. Access to Sky’s live football feeds makes the reporting possible, Jon Holmes, mobile editor, sport, of TeamTalk, told Journalism.co.uk. According to a report on Revolution, ITV is also getting in on the social media act, embedding Twitter updates relating to certain players onto pages on ITV.com. “The tool provides images of each player and ranks them based on the number of mentions they get on microblog Twitter. ITV is also giveing the chance to comment on the game through AudioBoo, the audio comment service available for iPhone users,” reports Revolution. Another development from the Telegraph’s use of Twitterfall to aggregate tweets around key Premiership terms on its live match pages. This entry was posted in Mobile, Social media and blogging and tagged bank holiday, bank holiday weekend, iPhone, ITV, Jon Holmes, Journalism.co.uk, mobile editor, player, Premier League, social media, the Telegraph, Twitter, United Kingdom on May 22, 2009 by Laura Oliver. “Google News was inaccessible for many on Thursday morning. But when it re-emerged, it sported newly prominent news videos hosted at YouTube,” reports Cnet. Some of the news headlines now feature a small YouTube logo. “Clicking on it triggers an embedded YouTube player with a news video. Although the videos had been present before, Google is calling attention to them with the new logo as part of a facelift launched Thursday,” Cnet explains. This entry was posted in Editors' pick, Handy tools and technology, Online Journalism and tagged CNET, google, Google News, player, YouTube on May 15, 2009 by Judith Townend. Appropriately enough a Twitter update from @BenLaMothe alerted Journalism.co.uk to an innovative new use of Twitter on Telegraph.co.uk’s sport pages. 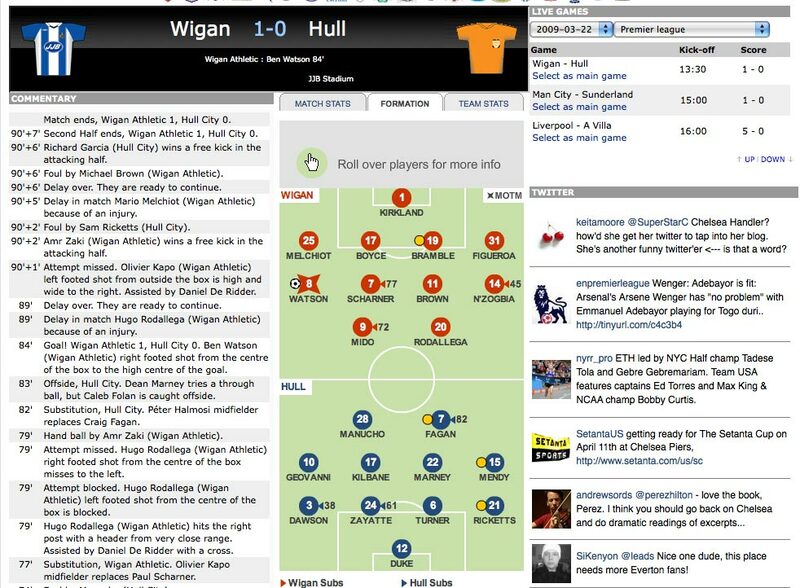 After displaying Twitterfall, which can be set up to aggregate tweets containing multiple terms, on its big news screens, a stream of relevant Twitter updates are displayed in a widget on the right-hand side of the site’s live Premiership football match report pages. Developed by a team of students, using Twitterfall could provide a neat way of following the conversations around certain players, transfer gossip or matches as they’re played. Ian Douglas, head of digital production at Telegraph.co.uk, explained to Journalism.co.uk that list of club names and key player names are currently being tracked, but if new trends or keywords emerge they can be quickly added. Certain tweaks to avoid irrelevant updates have been made – #chelsea is being used as opposed to Chelsea to avoid tweets about nights on the Kings Road, for example. The Telegraph wanted to trial Twitterfall on pages that have ‘a lot of activity and a lot of people talking’, said Douglas, but is being considered for other areas of the site and potentially topic pages. The appropriateness of the widget to a given page, because it updates so rapidly, must be taken into consideration, he added. The title is happy to look outside of its own development team to third parties when necessary, said Douglas, with other recent collaborations including this interactive guide to new Formula One cars. This entry was posted in Handy tools and technology, Online Journalism, Social media and blogging and tagged formula one, head of digital production, Ian Douglas, Journalism.co.uk, player, Telegraph.co.uk, the Telegraph, Twitter, Twitterfall on March 27, 2009 by Laura Oliver. This week the live video streaming service, Ustream, introduced Watershed, a ‘white-label service for websites and businesses that want to broadcast their own live streams’ on a pay-as-you-go basis, TechCrunch reports. “Watershed comes with a lot of extra management capabilities like the ability to customize the player, add a logo, turn on features like chat, polling, picture-in-picture video chat, Twitter integration, analytics and more,” TechCrunch outlines. This entry was posted in Broadcasting, Editors' pick, Online Journalism and tagged player, TechCrunch, Twitter, ustream, watershed, websites on February 19, 2009 by Judith Townend.